I'm kicking myself a bit today and not for any really valid reason. It's just that I'm wishing I had a spare $3,500 sitting in the bank so I could press the order button on this beautiful vintage discovery. While flipping through the new bags selection online, I came upon this pink perfection out of nowhere. Actually, I didn't even know that the website had a "buy vintage" option. Ok, in full disclosure here I'm not a regular orderer from the site so I wouldn't have really known this anyway. Yet, here I was quite literally salivating over a bag I had never seen before, even when it was actually available in Chanel stores. Here the world is lusting over Chanel leather espadrilles for their feet, when a bag exists that seems to put all those obsessions to shame. 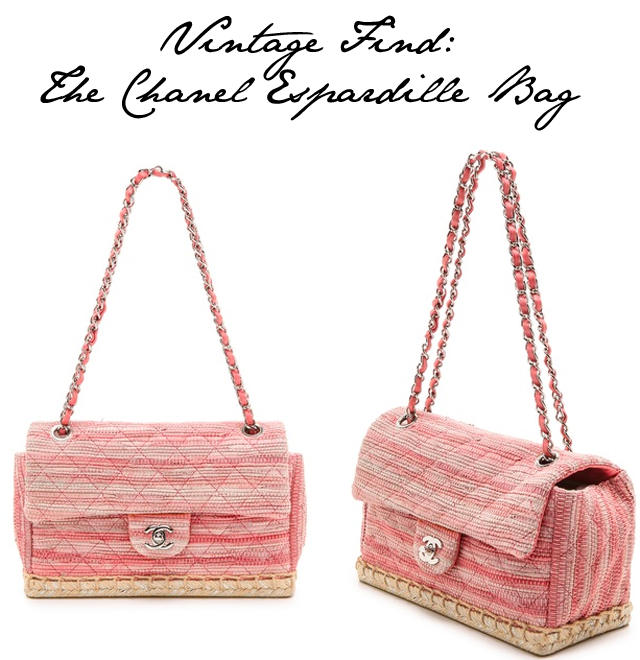 "Chanel Espadrille bag needs a good home. Will provide you with endless style entertainment, a safe and beautiful place to store all of your most cherished possessions and will never ever let you down under any circumstances. This bag is a soulmate willing and able to provide support for you and future generations, should you treat her kindly. All this for one payment of $3,500." Seems like a bargain now, eh? Give this beautiful pink darling a good home, won't you?